The RGi-RTR6x6-Z is specifically designed for long distance indoor/outdoor surveillance missions. The robots are a perfect match for private home, laboratory, university, hospital, warehouse, or inspection station locations. The unique 220x camera enables the robot to see up close from long distances. The camera has been integrated at the firmware level so that the focus and zoom functions are available via the RGi-DSCv3 software control panel. The RGi-RTR6x6-Z is built from tough anodized 0.10in (2.5mm) thick aluminum (13in x 14in x 5in), has 2 powerful motors, and a responsive 6x6 belt-drive system. Available in yellow, fire engine red, and military black powder coated colors. The robot can run extended missions with its standard lithium polymer batteries and advanced power management system. The RGi-DSCv3 software control panel can direct the robot to sleep for a programmable number of minutes. The RGi-DSCv3 software control panel provides control of the robot via a local area wireless network or via the Internet. The control panel is highly configurable and provides for the basic functions such as forward/backward, left/right, pan left/right, tilt up/down, camera zoom in/out and focus. It further provides an expandable control set that extends control to all other RGi products. Included with the Robot is the RGi-Advanced-Wireless-Controller a 6.2in x 5in (15.75cm x 12.75cm) dual CPU board that embodies a complete robotics control system and development platform. It communicates via wireless 802.11b/g WiFi, ZigBee 900Mhz or 802.15.4 ZigBee communications standards. The optional highly directional microphone is coupled with Pro Ears® DLSC™ audio enhancement and compression circuitry to provide the ultimate in remote hearing. The Pro Ears circuitry amplifies sound, filters out the noise and automatically compresses the high peaks to provide clear, consistent and natural sounds without distortion and clipping typical of other amplification schemes. Pro Ears® is the leading field proven hearing protection product since 1992. The Mintron Color Zoom Camera is a high-resolution, long body, color CCTV zoom camera, featuring 22X optical and 10X digital zoom (220X total zoom). The camera can be controlled directly from the RGi-DSCv3 software control panel. Multiple Frame Integration (Star Light Mode) allows the light sensitivity to be turned up to provide a minimum illumination range from 1.5Lux to 0.02Lux in color. See the 22X Zoom Demo below. The Integrated Pan&Tilt is made of self-lubricating, durable Delrin® and is powered by a miniature R/C servo and a Robotis AX-12. The pan unit has a range of 170 degrees with better than one degree resolution. The tilt unit has a range of 300 degrees with than 0.3 degree resolution. The 6x6 wheel belt-drive system features 6 wheels driven by 2 independent gearhead motors. The robot's highly maneuverable skid steering 6x6 drive make it a perfect match for tight confined areas. The two powerful motors make it suitable for use in large open areas. The WiFi 802.11b/g communications systems features the latest security protocols and uses TCP and UDP sockets to provide a state-of-the-art control system. Secure AES-CCMP & TKIP 128-bit encrypted communication prevents the robot from being hijacked. Exclusive SmartRoam® technology automatically attaches to the strongest access point signal. 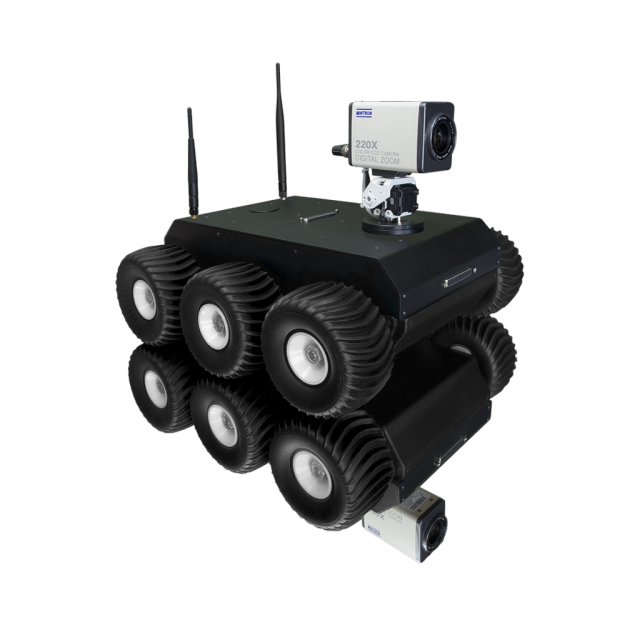 The RGi-RTR6x6 series robots are optimized for outdoor use. They are a perfect match for large locations. The robot's highly maneuverable skid steering 6x6 drive make them suitable for tight confined areas. The RGi-RTR6x6 series robots are easily programmable via the RobotBASIC programming/simulation environment. The RGi-RTR6x6 series robots have three (3) expansion ports. These are general purpose 37 pin ports and may be wired for your own requirements. The ports are located in front, top and rear for easy access to expansion peripherals. In the future, RGi will introduce a series of sensors that will attach the these expansion ports. The RGi-RTR6x6 robots feature advanced power management capabilities. The system provides programmable sleep times, inactivity timeouts, direct sleep mode, switchable power for the motor controller, radio sections and external webcams. This flexibilty allows you to extend your mission time from hours to weeks depending on your senario. The optional highly directional microphone is coupled with Pro Ears® DLSC™ audio enhancement and compression circuitry to provide the ultimate in remote hearing. The Pro Ears circuitry amplifies sound, filters out the noise and automatically compresses the high peaks to provide clear, consistent and natural sounds without distortion and clipping typical of other amplification schemes. Pro Ears® is the leading field proven hearing protection product since 1992. The RGi-LiPo-11.1 is a 10Ah, 11.1V LiPo battery pack. The pack features built-in cell balancing and over voltage protection circuit. An optional 2nd battery pack can be installed to double the run-time. The battery pack offers higher energy density than standard NiMH batteries.